To ensure healthy teeth and gums throughout your lifetime, it is essential to brush thoroughly and regularly, floss daily, and have your teeth professionally cleaned by a dental hygienist at least every six months. Regular and properly-performed daily homecare can keep tartar from building up and turning into calcified plaque deposits. Keeping away plaque deposits can prevent the gums from becoming inflamed, losing their tone, and developing “pockets”, or spaces between the gums and teeth which in turn leads to further inflammation and deeper pockets. Untreated, these pockets can lead to periodontal (gum) disease which can damage underlying jawbone and leading to loss of teeth. Even the most adept brushers and flossers will develop deposits, and regular hygiene appointments can take care of removing these deposits before they become problematic. 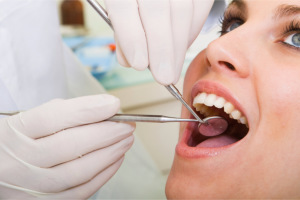 Your dental hygienist will thoroughly remove all traces of tartar and calcified plaque. This is done either with instruments called “scalers”, or an ultrasonic tool called a “Cavitron”. Sometimes a combination of both techniques is used. The hygienist will then polish your teeth with a low-abrasion paste to keep the surface smooth and less resistant to build-up. In some instances she will apply fluoride to strengthen enamel. Based on your exam, your hygienist will tailor your treatment and frequency of visits to best suit your specific needs. Maintaining ideal oral hygiene is the best way to prevent decay and bone loss in your dentition over your lifetime. Many high-profile studies have emerged in recent years that point to a potential link between periodontal (gum) disease and cardiovascular disease. Our hygienists are licensed professionals, dedicated to preserving and maintaining your oral health, as well as educating you so that you can develop excellent home-care habits. Regular hygiene visits and good home-care habits are the most important routines you can employ to gain maximum longevity from your natural dentition. We consider the preventive dental hygiene appointment to be one of the most valuable services we offer to our patients.